The support structure of archaic civilization and the spirit of Greece ? Welcome to the city of Athens! Athens in Greece played an imperative role and holds an exclusive place in human history. This city was the birthplace of culture, history, theatre and philosophy. Modern days Olympics were born in Athens. The ancient Olympics were principally a part of a spiritual celebration in tribute of Zeus, the father of Greek Gods and Goddesses. Read more on traveling to Athens and how to pack in the various sights and sounds in your itinerary. Hailed as one of the legendary cities of the world, Athens is the capital of Greece and is named after the goddess Athena. With a population of 3.2 million people, Athens is burgeoning as a leading business centre in Europe. It holds pride of place as a distinguished centre of learning, home to Plato?s academy and Aristotle?s Lyceum. Extravagant ancient monuments and artworks, the Parthenon on the Acropolis, cherished by Ictinus, Callicrates and Phidias bear testimony to ancient Athenian skills. Temperature in Athens goes up to 88 degree Fahrenheit in summer. The city remains sunny from April through November. Athens receives sunshine for an average of 300 days every year. Snowfall occurs during winter in the mountains but rarely at Athens. Greeks are food lovers; their food is not too spicy and is cooked healthily in olive oil. The restaurants in Athens encourage the customer to walk into the kitchen and choose from the variety of food they offer. Athens is a popular tourist destination in Greece and is well connected with places all over the world. The airport is situated 27 km northeast of Athens city, and is well connected through cabs, trains and buses as intercity transport. Visitors who are first timers to Athens are for sure to be sandwiched between the miscellany of the old and new world, amidst the Gods and the shops of Plaka, flanked by the ancient art and green roofed terraces. Panathenaic stadium: Situated at the base of Ardittos Hill in Pangrati region of Athens, this stadium hosted the first ever Olympics in 1896. The present stadium was built on the spot of the original stadium which was just about 2,300 years old. Athens concert hall: Popularly known as Megaron, this hall boasts of fantastic acoustics and stylish exteriors built of marble. Attica Zoological Park: It has over 270 unusual species of birds and is in fact the third biggest bird park in the world. Temple of Olympian Zeus: It was built around 1500 years ago for the worship of the Greek God Zeus. Parliament building: Built in 1840, it was a Royal palace which was destroyed by fire in the early twentieth century. It was restored again to house the National assembly. Hadrian?s Arch ? This was the original gate that connected the Roman quarters with the original town of Athens. Acropolis ? This is one of the most prominent landmarks in Europe and the traditional Greek architecture that has become a great icon of the city. Plaka: This is the old part of the city, well-known for its intricate maze of streets and primordial buildings. The Acropolis museum: This is a very important museum in the world showcasing stone sculptured monuments of the Acropolis. It was constructed between the year 1865 and 1874 and was designed by Panage Kalkos. 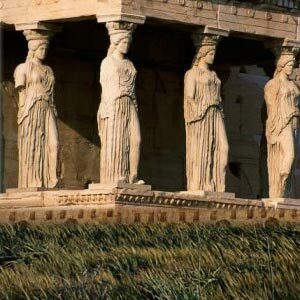 Chief collections are sculptures of Erechtheion frieze, frieze of the Athena Nike temple, Panthenon frieze and the Caryatids. Don?t miss the Relief of the Mourning Athena. Museum of Greek popular musical instruments: Cretan musicologist Phoebus Anogianakis donated over 1200 musical instruments to this museum in the year 1978. This museum is quartered in a stylish 19th century mansion. Museum of city of Athens ? It is a stately mansion that dates back to the 1830?s and was once a regal dwelling. Natural history museum ? An important attraction in Athens, the national history museum has a huge gathering of fossils, birds, reptiles, mammals, and insects, 200,000 plant species that include rare specimens and rocks and minerals. Benaki museum ? Named after the cotton merchant Benaki, this museum was built in 1931. His house was converted into a museum and holds the best of Greece display that include mixture of gold, bronze, terracotta antiquities, bronze age artifacts, jewellery, textiles etc. Museum of Cycladic art ? Started in 1986 this museum houses the best of Cycladic art. It has ancient Greek art dating from about 5,000 years ago. Byzantine museum ? This Florentine-style, neo-classical mansion houses a huge collection including Byzantine art and architecture dating back 1,500 years ago.